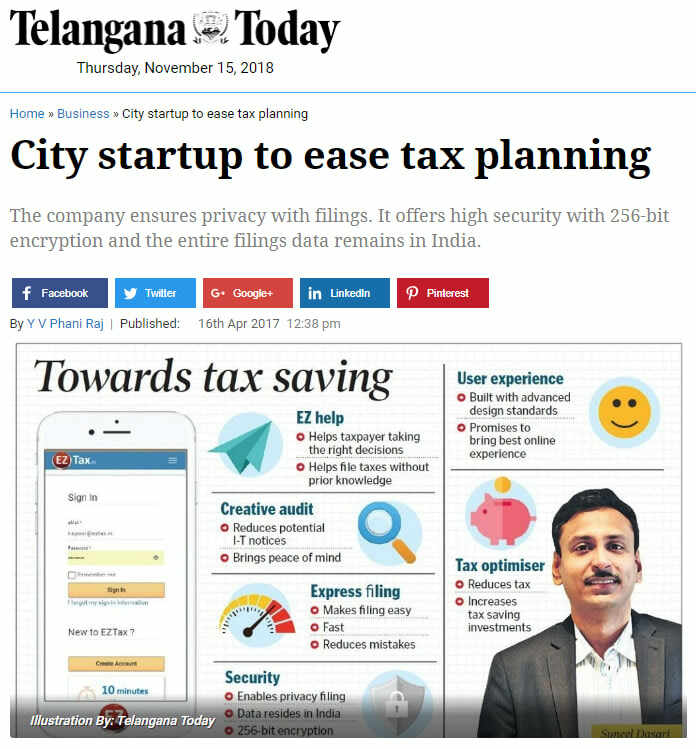 Hyderabad: Hyderabad-based startup MYD Labs has created an advanced tax engine EzTax.in that aims to bring in savings and help reducing potential income tax notices. The company makes tax filings easy, faster and reduces mistakes that tax payers usually commit besides helping the users plan and save. The company ensures privacy with filings. It offers high security with 256-bit encryption and the entire filings data remains in India. The primary goal of the company is to build a tax optimiser that ensures tax reduction with appropriate guidance and increase tax saving investments. He said, in their research, they found that every individual who files Form 16 on an average can save over Rs 7,000 if appropriate guidance is given. So, the company is pitching on its USP that if individuals spend ten minutes on its portal and utilise it, they can save upto Rs 10,000. The company which began its operations in March 2016, has already done some 1,000 filings so far. It has entered this space to fill the compliance gap. The company believes, on an average, a salaried individual pays around Rs 26,000 taxes. And then can make some savings. MYD Labs has created a unique feature called ‘Creative Audit’, which avoids concerns of getting a tax notice. Based on the occupation of an individual, the platform gives relevant advice. Traditionally, chartered accountants are doing it, but the machine will do here. Suneel said the company has tried to make the 3,500 page tax document easy to understand. The portal is also smartphone friendly and the application is portable to every device. The portal can also be used on a smartwatch. The portal also features real-time refund calculation which makes the tax payer know the refund immediately. Compliance for taxation is gaining attention in the last 1-2 years. But there is a need to create a culture of tax paying and filing. “There is competition in this space. But we will take taxation to the next level. We are ramping up our operations, taking up standardisation and innovation. We are keen to create a fintech revolution in taxation,” he added. The company is an authorised e-return intermediate in India, directly working with the Income Tax Department. There are 140 such intermediates in India. Its Creative Audit feature is built with guidance from senior most chartered accountants in India. With an 18-member team, MYD Labs has 100 chartered accountants affiliated to it. Globally, self-attestation is the best attestation presenting one’s promise that their data is legal, this culture should gradually reduce the chance of misusing the tax filing portals by black money holders. MYD Labs is a multi-crore venture. It is self-funded as of now. The company which offers free filing, assisted filing and consultation through chartered accountants is soon going to introduce Easy TDS and enter into taxation services relating to the GST. He informed, “We are looking at revenues from data analytics and TDS segments going forward. We don’t want an individual to just fill the form and file the returns. We want the process to be beyond it and value add with our services. We are not just involved in the original tax filing, we are also into late or revised filings. We are going to use Codec for the first time in taxation. There is a lot of innovation taking place in our organisation. GST oriented offerings may not come immediately but we will eventually be there.